I am an introvert. Often when I say that, people respond by saying, "What? You're not shy!" Well the two aren't synonyms (plus "shy" is really an insult in our society so you shouldn't just go throwing that word around.) I have taken the Myers-Briggs Personality Test 4 times, the short test twice and the long test twice. The other three letters (N/S, T/F, J/P) I flip-flop on (although I am consistent on the short test and consistent on the long test.) But the letter I never changes. That is my strongest personality trait by far. And one that has always been criticized. Our American society values extroverts more strongly than any other, and that's a detriment if 40-50% of people are introverts. Not to mention, it's hard for the extroverts to keep talking if there's no one there to listen. Not that listening to extroverts is our only value. But that balance is necessary. 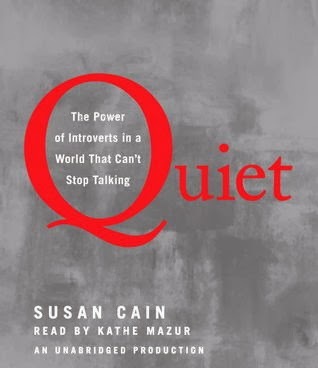 I listened to this book on audio and each day when I came in from my 2-hour walk, I would tell my husband what cool new fact I had learned that day, or what new insight I had into our relationship or how I work. For example, introverts tend to be very sensitive. Which not only means we are more likely to get our feelings hurt and feel guilty about things, but it also means we're more easily overwhelmed by stimulus. While driving, introverts need to be wary of being distracted, while extroverts need to be careful not to get too bored. It also explains why extroverts can tolerate overly stimulating experiences much better and longer (the mall during December, the grocery store the day before Thanksgiving, theme parks). I learned a ton from this book. It has tips on how to better use your introverts traits, how to raise an introverted child, and how to deal with introverted students as a teacher. It turns out that an introverted manager is better for business if she has a lot of self-motivated staff who are creative with coming up with new ideas. However, an extroverted manager is better if the staff are more of the hard-working, non-creative type. Introverts can be very good sales reps (I was one myself for two years) although the ones that really win at that race are called ambiverts - they really come down in the middle on the I/E scale. 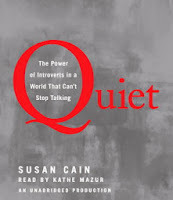 This book is fascinating and anyone who is or loves an introvert would learn a lot from it. It was also well-written and interesting. I really liked the narrator, who was soft-spoken and yet assured; perfect for this book. Ms. Cain had obviously done her research but she didn't load up the book with science and statistics. The tips for things like improving public speaking would be helpful and I liked her name-dropping of famous introverts throughout. It made me feel that I was in excellent company. I loved this book and found especially interesting the section about fussy babies being introverts. I was fussy. My introverted child was the fussy one while the extrovert wasn't.